Ok, don't start laughing, I just found my new boyfriend ^^. And yes, today we're making breakfast together. Now, when you see the picture, you can be sure that he is my NEW BOY FRIEND!!!! The recipe is an adaptation from "スイーツ男子CD vol.3 ふわっふわカッテージチーズ入りパンケーキ編", a new drama cd that I like. 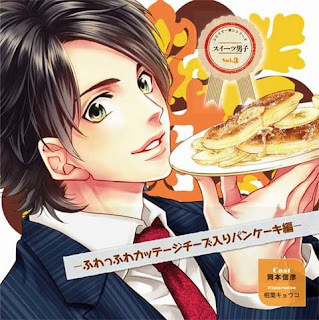 This time the voice actor is 岡本信彦 (Okamoto Nobuhiko san), his voice in this CD is childish and cute (Drama cd is a situation cd that the seiyuu will act by using his voice only ^^. I love listen to Drama CD, it's amazing that one voice actor can make his voice different in each role) If you remember there are some recipes which I got from drama cd too, こねこねハンバーグ (Hamburger) and ととろ~りプリュレ~ (Crème brûlée). For this time, the situation is the morning before big presentation. I (ok, please allow me to be a heroine, haha), and he who is gonna be my boyfriend (he is a younger co-worker), we had to stay at the company all night, preparing the presentation. In the morning, while I wanted to go back home to take a shower before coming back to the company, he suggested that I can go to his apartment that closer to the company instead (stop thinking about other situation than cooking, this one is not rated CD, haha). 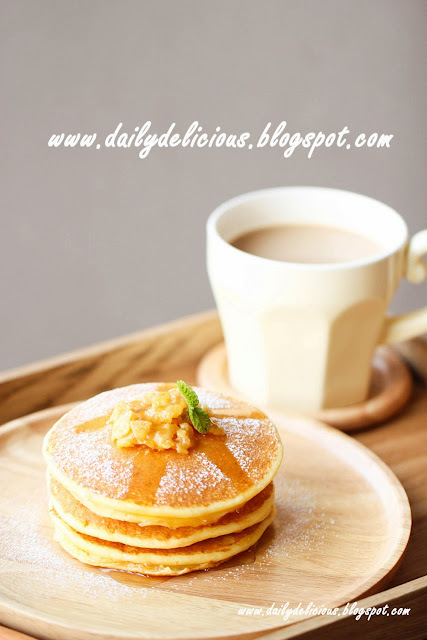 After taking a shower, I said that I wanted to eat cheese pancake and he said that he will make it for me. And now we come to the point ^^. (There are a lot of thing in the CD, hehe, the situation is so cute and funny, it makes me laugh out loud, but I know I need to stop here or you think you come to the right blog or not, so if you really want to know about it please write to me ^_-*). I really want to make it right away after listening to it, and I end up making 2 times by now. I adapted the recipe a bit, to make it suits my taste and reduce the portion so it will fit for making for 2 people. 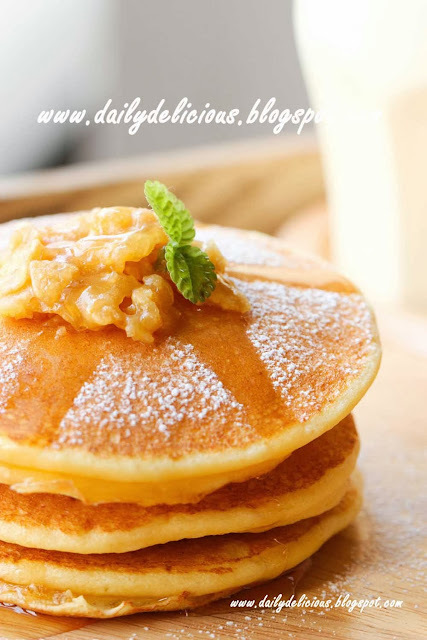 The pancake is delicious and quick honey comb butter taste great, but the only problem is quick honey comb butter is not good for keeping, it's delicious within the day it made (the cornflake will be chewy). If you want add some banana into the plate will make it more delicious. Now, if you're ready, come and enjoy breakfast with my cute boyfriend, I know that you will have a happy time (like me) too. Put the egg yolks into a bowl with cottage cheese, milk and sugar, mix until fully combine. Pour the flour into the bowl, beat to combine. 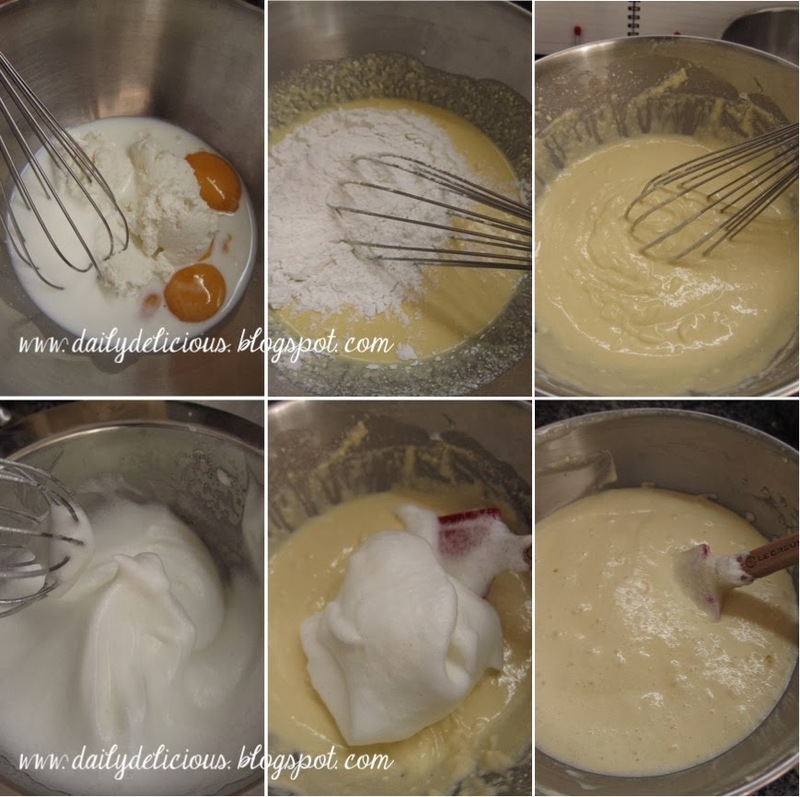 Whip egg whites with a pinch of salt and sugar until firm peak formed. Fold the meringue into flour mixture (divide into 3 additions), fold until combine. 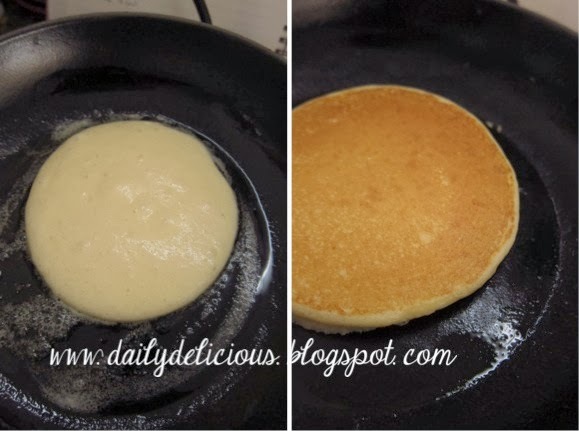 Heat the frying pan over low heat (or medium low), put the butter into the pan after the butter melt, fry the pancake (I use 1/4cup of batter for each pancake) until golden brown (about 2-4 minutes on each side depend on the heat). 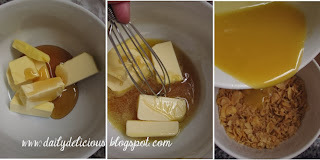 Put the butter with honey and a pinch of salt into a microwavable bowl, heat in the microwave for 30 seconds (600w), or until the butter soft and start to melt. 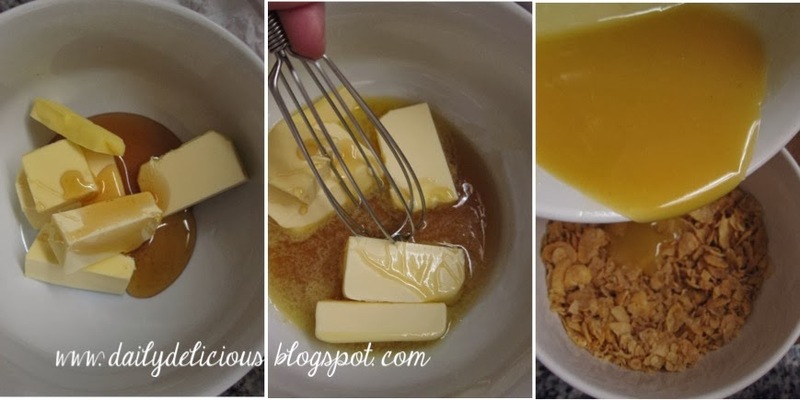 mix the butter and honey together, then pour into the cornflake bowl, mix to combine. Place the pancake onto the plate, spread Quick honey comb butter over the pancake, then put another pancake and repeat the process . 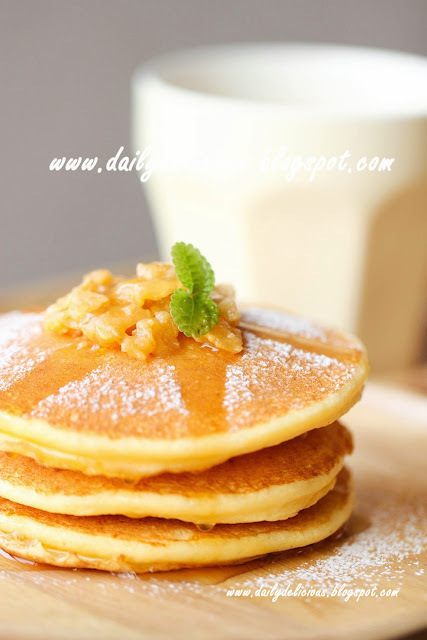 Pour the honey over the pancake, and sprinkle with icing sugar. why my pancake burn the sides only and didnt have nice golden colour? 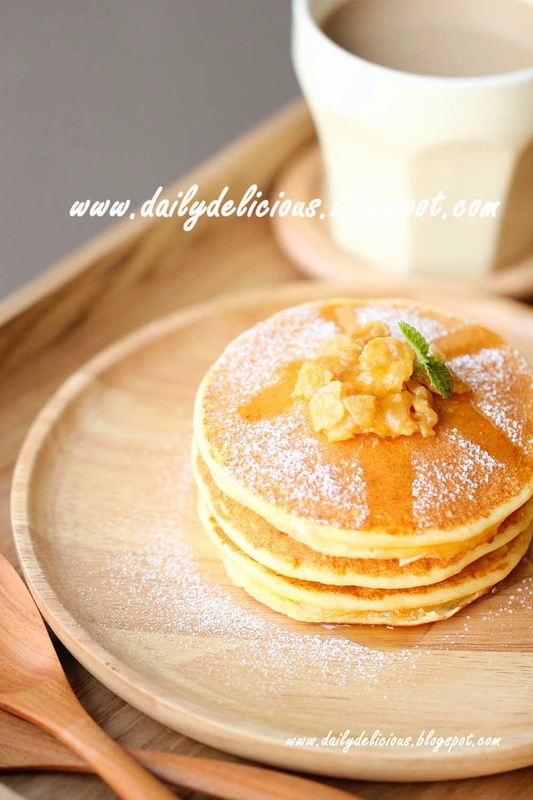 did u use special saucepan for pancakes? Try reduce the heat and use non stick pan, it give you better result ^^. Chinese Egg Tarts: Delicious little tarts! Chocolate almond cake: Chocolate is good for you!